Away from the crowd, selecting your own itinerary. In Crewed or Private Yacht Charters; everyday the yachts normally visit two or three bays and there would be a maximum 4 hours sailing per day. The last stop in a day will be the place to stay for the night. It is necessary for the yacht to visit a harbour every three or four days to enable us taking on water and fresh provisions. These harbours will be in little fishing villages and sometimes in small towns. Traditional wooden yachts usually cruise with engine, but they sail if the wind direction fits to the rotation and is strong enough. Turkish cuisine is ranked among the world's top cuisine's - right there after French and Chinese. Fresh vegetables and fruit are plentiful, deliciously fresh and lusciously sun-ripened. Bread is a particular treat - freshly baked every day and dangerously more-ish! Whilst on board, your day will start with traditional Turkish breakfast, consisting of fresh bread with cheeses, olives, honey and jam, yogurt, tomatoes and fruit. A light lunch is next in line - with perhaps stuffed aubergine, rice and salad one day, and savoury pastries stuffed with meat or cheese (börek), accompanied by the traditional combination of yogurt, salt and water known as ayran, the next day. Afternoon tea takes place around 4pm. After an early evening nap, dinner concludes the day with traditional mezes, freshly grilled seafood and meats, salads and fruit to finish as the sunsets and stars come up. You might want to try to catch your own fish for a barbecue on board or on the shore - as with everything on a gulet cruise, flexibility is the key. 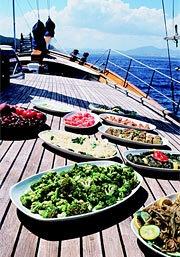 Private Charter guests are also welcome to provide and cook their own food if they so wish. All our traditional yachts are equipped with windsurf, dingy with outboard fishing and snorkeling equipment. There are ample possibilities of different water sports such as jet-skiing, water-skiing, banana riding at modarate prices organised by special water sports groups at different bays visited. Up on request we can arrange jet skiing, water skiing equipment to hire during your charter. Once the boat is moored the clients can visit the archaeological ruins, having a little walk in to the pine forests and explore the beautiful coastline. Reading your book and having a siesta under the tent with a breeze may be another option. Of course, sealovers would enjoy swimming, snorkelling and sunbathing. In charters you can join to land excursions to the nearby local towns, ancient sites, natural attractions. For instance in Bodrum-Gökova-Bodrum programme, you can join Marmaris tour or in Marmaris-Fethiye-Marmaris programme you may visit Caunos. We also organize shopping tours to local handicraft centres or bazaars to make you see the extensive carpet, leather, jewellery, textile products or gift items of Turkey.